Oasis slammed into Philadelphia's First Union Center on December 3rd for one of only t-h-r-e-e U.S. dates, all radio shows. This, the first stop in the States, was the Y100 Festival. Oasis shared the bill with Moby, Foo Fighters and Beck, none of whom would prompt me to make the trip from NYC. But for Oasis? OH yeah! HELL yeah! With the first giant sultry notes of opener 'Cigarettes and Alcohol' Oasismania surged through the arena and through my blood as I immediately realized HOW MUCH I missed this band. The Gallagher brothers dished out loads of attitude and begged to be impressed. 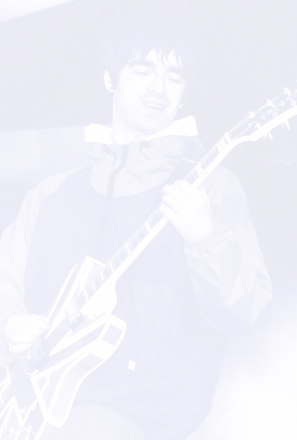 Liam played the packed photo pit like a marionette, while Noel, looking very trim and well-groomed, was having a private conversation with his guitar, occasionally noticing that there were other people in the room. Alan White provided a solid rhythm foundation laced with dynamics, knowing when to lighten up and when to kick in. I didn't have a fair chance to really hear the new guitarist, Gem, formerly of Heavy Stereo, or the new bassist, but their stage style is certainly in the mode of the departed Bonehead and Guigsy, i.e. stationary. Who knows, maybe the Gallagher brothers nailed their shoes to the stage? Not that it would matter. Oasis can do whateverthefucktheywant on stage because their sound is so huge. The two hours there and two hours back were WELL worth every second of the thirty minutes spent seeing one of the best bands in the world. The obligatory 'Wonderwall' followed to a predictable immense response. 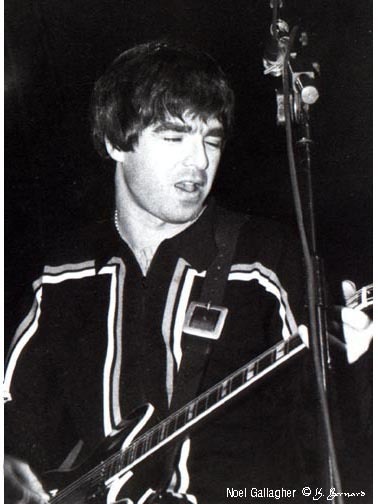 I would much rather have heard 'Slide Away' or 'Acquiesce', but the charts commanded the always-welcomed 'Wonderwall'. Then, however, we were treated to 'Champagne Supernova', which felt like a long lost pal showing up to give a big hug. Fuzzy time ended quickly, though, because the set closer was a bass thumping, run on, ROCK-THE-WORLD version of 'Helter Skelter', as the boys paid homage to their patron saints. I would have loved to stay to catch Beck, but the last train back to NYC that night left in 18 minutes. Anyway, I needed to get home to listen to Oasis CDs. The two hours there and two hours back were WELL worth every second of the thirty minutes spent seeing one of the best bands in the world. The fourth full release from the band, STANDING ON THE SHOULDER OF GIANTS is due out on February 28th, 2000.